OIL CONTAINED FLIGHT DECK FIX NUCLEAR PLANT OIL CONTAINED FLIGHT DECK FIX NUCLEAR PLANT 48 JANUARY 2017 COATINGSPROMAG.COM YEAR S Celebrating 14. March 2015 was muy bien for CoatingsPro's readers. We translated our first article, which featured a crew from Mexico; it was published online en Español along- side the English version. 2010 2011 2012 2013 2014 2016 2017 2015 JANUARY 2017 W W W . C O A T I N G S P R O M A G . C O M 2017 COMPANY PROFILES TOP COATINGS INDUSTRY COMPANIES PG.56 SAFET Y NET AUTO SHOP QUARTET CONCRETE C A SE » TICK TOCK FOR SPF ROOF » STEEL FLUE CLIMBERS » ONLINE REVIEWS PAY TO PARK YEARS Celebrating Anniversary Issue! 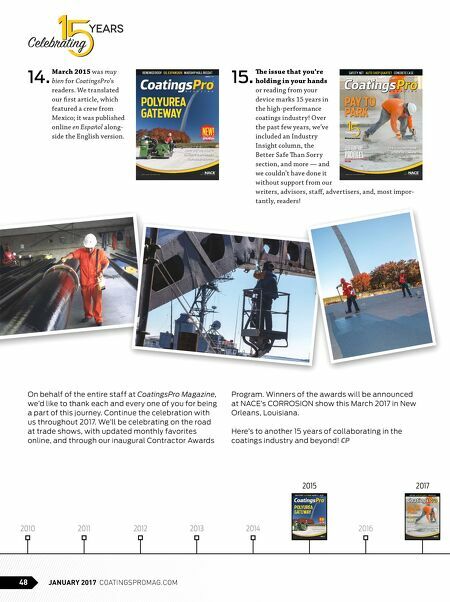 15. e issue that you're holding in your hands or reading from your device marks 15 years in the high-performance coatings industry! Over the past few years, we've included an Industry Insight column, the Better Safe an Sorry section, and more — and we couldn't have done it without support from our writers, advisors, staff, advertisers, and, most impor- tantly, readers! On behalf of the entire staff at CoatingsPro Magazine, we'd like to thank each and every one of you for being a part of this journey. Continue the celebration with us throughout 2017. We'll be celebrating on the road at trade shows, with updated monthly favorites online, and through our inaugural Contractor Awards Program. Winners of the awards will be announced at NACE's CORROSION show this March 2017 in New Orleans, Louisiana. Here's to another 15 years of collaborating in the coatings industry and beyond! 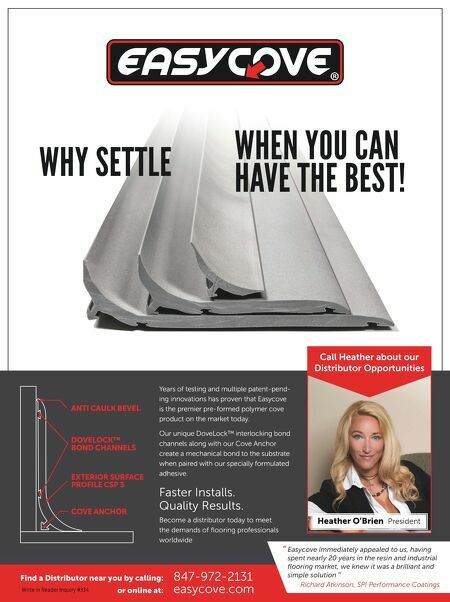 CP JANUARY 2017 W W W . C O A T I N G S P R O M A G . C O M 2017 COMPANY PROFILES TOP COATINGS INDUSTRY COMPANIES PG.56 SAFET Y NET AUTO SHOP QUARTET CONCRETE C A SE » TICK TOCK FOR SPF ROOF » STEEL FLUE CLIMBERS » ONLINE REVIEWS PAY TO PARK YEARS Celebrating Anniversary Issue!